The New York Post reports that every year the Sister Servants of the Immaculate Heart of Mary in Stone Harbor, NJ, host a surfing competition. This year the " Nun's Beach Surf Invitational" will be held on September 11th. Proceeds from the event go to support the nun's retreat house, Villa Maria by the Sea. New Jersey is blessed with some beautiful retreat houses on or near the ocean. In addition to the Sister Servants in Stone Harbor, the Sisters of St. Joseph have St Mary by the Sea in Cape May, the Vincentian Fathers used to have a place in Cape May (not sure if they still do) , and the Redemptorists have San Alfonso retreat house in Long Branch. 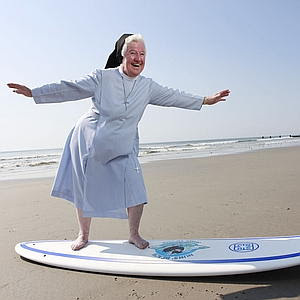 While Sister James (pictured above) said that the closest she gets to surfing is standing on the board for a picture, it occurred to me that perhaps the priests of the Marians of the Immaculate Conception could host a surfing fundraiser and actually have one of their own, Father Donald Calloway, compete. Now that would be like totally awesome. 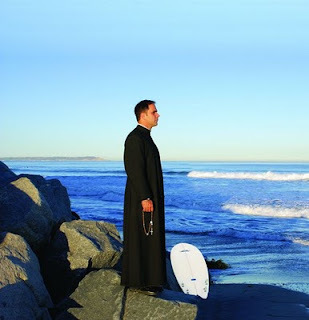 If you haven't read Father Calloway's incredible conversion story, go to his website: www.fathercalloway.com and learn how he caught the wave of his life.